Witness what 180 countries experienced in the Opening Ceremonies of the FINA World Championships. 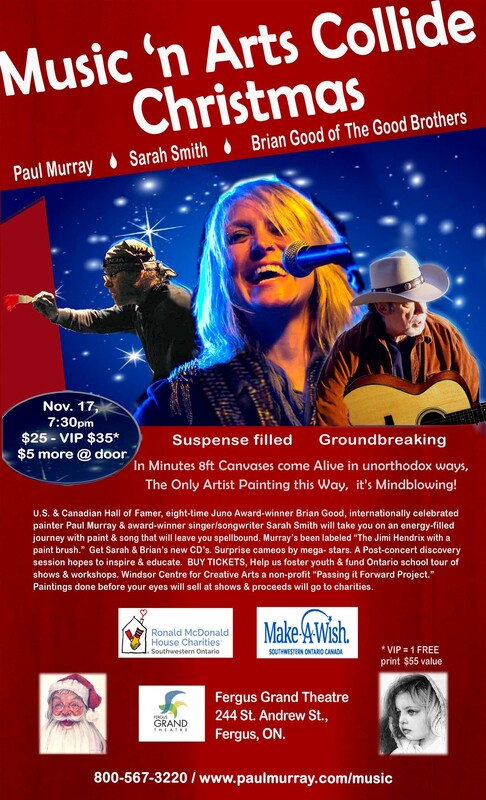 U.S & Canadian Hall of Famer, eight-time Juno Award-winner Brian Good & internationally celebrated painter Paul Murray & singer/songwriter Sarah Smith will take you on an energy-filled journey with paint & song that will leave you spellbound. Country, rock classics & originals, all mixed with revolutionary performance painting by Murray. He’s been labeled “The Jimi Hendrix with a paintbrush.” Sign up for Post-concert discovery session with the artists. An educational, inspirational experience learn what it takes to follow your dreams. These artists will be joined by surprise cameos by iconic stars, during the tour. Buy your ticket now; this helps us foster youth in the arts & funds our show tours & workshops and mentoring in Ontario schools. Post-concert a FREE 30 min. Masterclass discovery session with Sarah & Paul. A fun, inspirational experience, learn the business, the secrets, and what it takes to follow your dreams. Witness what 180 countries experienced in the Opening Ceremonies of the FINA World Championships. U.S & Canadian Hall of Famer, eight-time Juno Award-winner Brian Good & internationally celebrated painter Paul Murray & singer/songwriter Sarah Smith will take you on an energy-filled journey with paint & song that will leave you spellbound. Country, rock classics & originals, all mixed with revolutionary performance painting by Murray. He’s been labeled “The Jimi Hendrix with a paintbrush.” Sign up for Post-concert discovery session with the artists. An educational, inspirational experience learn what it takes to follow your dreams. These artists will be joined by surprise cameos by iconic stars, during the tour. Buy your ticket now; this helps us foster youth in the arts & funds our show tours & workshops and mentoring in Ontario schools. Post-concert a FREE 30 min. Masterclass discovery session with Sarah & Paul. A fun, inspirational experience, learn the business, the secrets, and what it takes to follow your dreams.